As fall ushers in the colder weather and the leaves start to change from green to red, brown and gold, one of the best festivals happens during this wonderful time of year. Oktoberfest is held each year around the globe and two of the best places to celebrate this cultural event is right here in the Northwest! For those who can’t make it all the way to Munich to celebrate, Washington is home to our very own Bavarian Village, Leavenworth. The Washington State Fairgrounds in Puyallup also hosts an exciting Oktoberfest event of their own. These two events give visitors an authentic feel and taste of the true German Oktoberfest spirit. With delicious food and beer and lots of fun activities, attending Oktoberfest is a great way to celebrate our fantastic Washington fall weather! Oktoberfest is a traditional, yearly event held in Munich, Germany and starts the third weekend of September and ends the first Sunday of October. The festival dates all the way back to 1810, when Crown Prince Ludwig married Princess Therese of Saxony-Hildburghausen on the 12th of October. The citizens of the city of Munich were invited to attend the wedding festivities held on the fields in front of the city gates. The royal family held horses race to mark the end of the festival. The next year the horse races were held again and this gave rise to the yearly tradition of Oktoberfest. The following year in 1811, in order to boost Bavarian agriculture, the first agricultural show was added. The first few decades of the festival did not have the amount of attractions that a visitor can experience today. At first, there was a carousel, a few swings and a couple of small beer stands. Over the next few years, beer tents and halls sprung up with the backing of breweries. Today, Oktoberfest is the largest festival in the world. This year is the 183rd Oktoberfest and the city of Munich will see about 6 million visitors converge on the city to celebrate German food, drink and traditions. For those of us that can’t make it all the way to Europe to celebrate this fun event, the state of Washington is fortunate to have our every own Bavarian city. Leavenworth is a delightful city surrounded by the picturesque Cascade Mountains and is the next best thing to being in the city of Munich. This festival runs the weekends of September 30th until October 1st, October 7th and the 8th, and the final weekend is October 14th and 15th. The city has four venues with live entertainment, delicious food and beer, and fun activities. Make to attend the traditional Keg Tapping Ceremony at 1:00 pm every Saturday when Leavenworth’s Mayor will honor a Bavarian Tradition of “tapping the keg”. 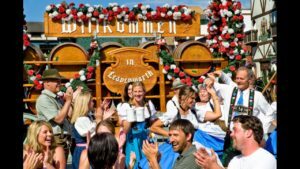 The festival in Leavenworth began in 1998 when Projekt Bayern, a non-profit organization created to promote the old world Bavarian theme through the city, came up with the idea to host an authentic Oktoberfest in the city. Every year has seen an increase in attractions and in visitors. Currently, over a million people come to visit the city for the festival. This fun celebration is $10 for admission on Fridays and $20 for Saturdays with children under 12 free. There is also free admission for active military members with valid ID. If you can’t make it over to Leavenworth for the celebration, then head to Puyallup for the best Oktoberfest celebration in the South Sound. This authentic celebration at the Washington State Fair Events Center in Puyallup is on October 7 through the 9th. Oktoberfest Northwest hosts the largest Munich style Festhalle Biergarten and features genuine German food, beer, and entertainment. The featured events at Oktoberfest Northwest include the 5k Stein Dash, the Hammerschlagen, and the Weiner Dog races. On Sunday, October 9th the Stein Dash is a fun run that pairs running with beer tasting. When you sign up for the 5k you get a commemorative stein, an event shirt, a bib number, and a token for a free drink. There are 3 pit stops on the 3.1 mile run where participants can fill up their stein with a different beer at each stop. Another fun event at Oktoberfest Northwest is the Hammerschlagen Tournament of Champions. This event is a competition to see how fast an individual can drive a nail into a cross section of wood. 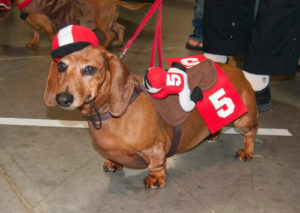 One of the most unique events at Oktoberfest Northwest are the wiener dog races. The “Running of the Wieners” is for Daschunds of all shapes and sizes and benefits local rescues chosen by race organizers, NW Wiener Races. Oktoberfest Northwest is located at the Washington State Fair Events Center at 110 9th Ave SW in Puyallup. This family-friendly event has something for everyone and is the perfect way to celebrate Oktoberfest. Oktoberfest is a fun way to not only celebrate fall but to celebrate a time-honored German tradition. Oktoberfest has deep traditional roots and the Northwest offers many fun ways to celebrate but the best events in the state are right in our very own backyard. The Washington State Fair in Puyallup has a wonderful celebration filled with delicious food and beer and a lot of fun events. This event in the South Sound is perfect for the whole family. 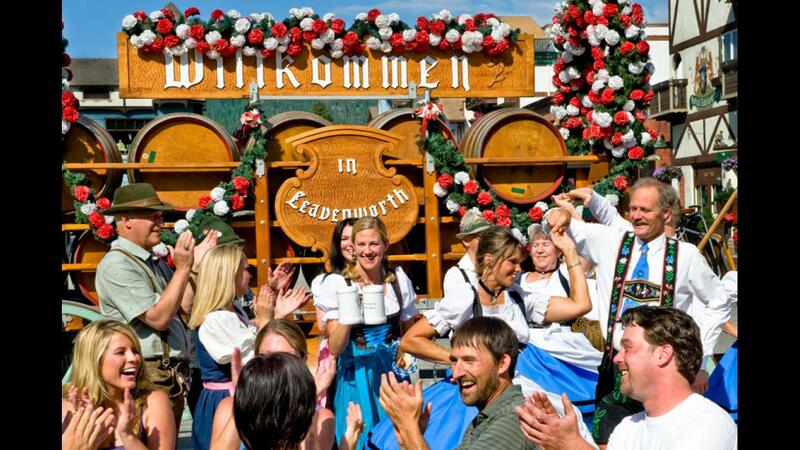 Our very own Bavarian Village, Leavenworth, has the most authentic Oktoberfest celebration in the nation. The beautiful backdrop of the Cascade Mountains and the traditional architecture of the buildings create the perfect ambiance for Oktoberfest. We would love to hear your thoughts about your favorite part of Oktoberfest. Tweet us and let us know!